Chorizo is a fermented, cured and smoked sausage. 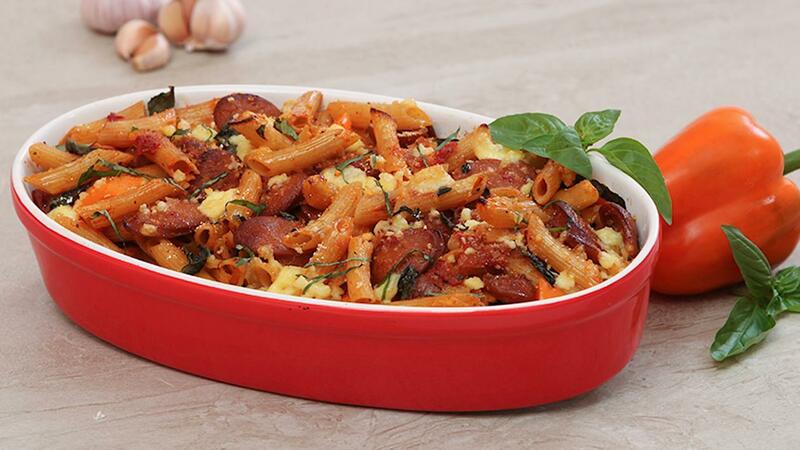 We came up with a baked pasta variant. We recommend using Knorr tomato pronto to bring the real Italian tomato flavor and goodness. View the full recipe below. Preheat oven to 180°C; cook chorizo in a frying pan on high for 2 minutes until browned. Add onion, peppers and garlic sauté till brown; stir with Knorr Tomato Pronto; cooked pasta; basil and seasoned with Knorr chicken seasoning powder and crushed pepper. Transfer to appropriate ovenproof dish; combine cheese and baked until the cheese melted and golden.